Home / Amazing / Message in a bottle How about 50,000 sealed Guinness bottles dropped Into the ocean! Message in a bottle How about 50,000 sealed Guinness bottles dropped Into the ocean! In 1954 A.W. 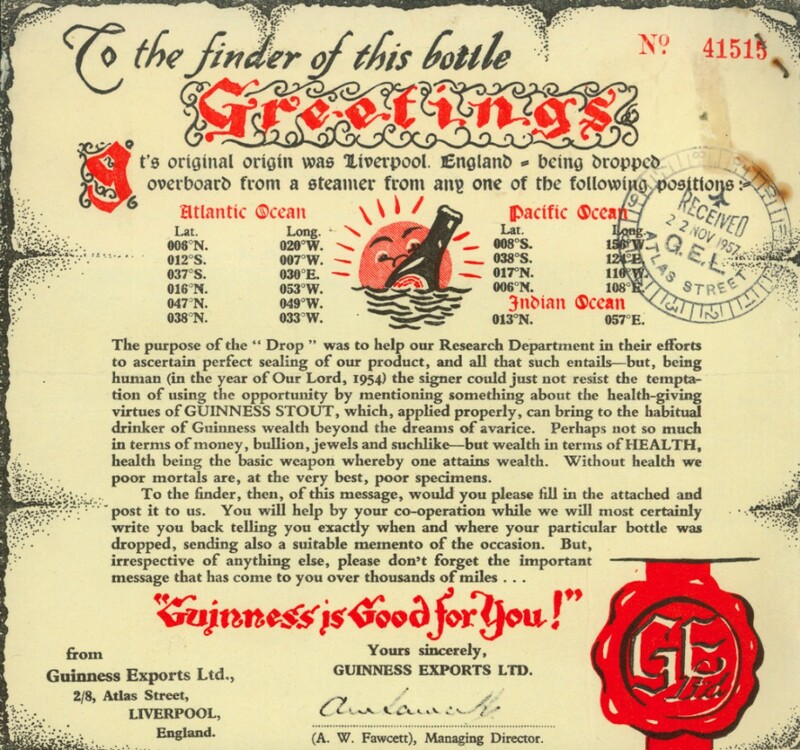 Fawcett, the managing director of GUINNESS and a master at promotional advertising for his time, initiated the idea to drop sealed bottles of Foreign GUINNESS from ships at various points around the world’s oceans. The bottles contained messages for those lucky enough to find them washed up on the shore! During the summer of 1954, 50,000 bottles were dropped in the first and lesser of the two drops undertaken in that year. A numbered greetings message was enclosed which asked the finder to tear-off a part of the message and return it to GUINNESS Exports, reporting the location and date of the find. Many did so and each received a personal reply and a small memento of the event. 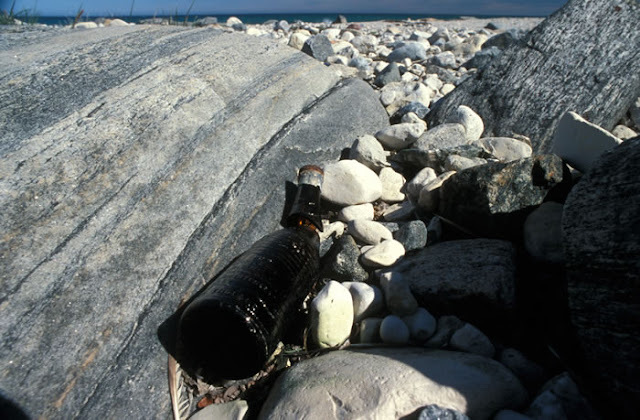 ome bottles were found in Liverpool docks, others from the Bahamas, Tahiti, the Azores and Mexico. The success of the idea led to the decision to treble the scale of the drop to be done in the bicentenary year of 1959. In July of that year, Guinness celebrated 200 years since the establishment of the company. To mark the occasion, an unusual publicity stunt was mounted, where some 150,000 specially embossed bottles were dropped into the Atlantic Ocean from 38 different ships over a period of 6 weeks. The 45 bottles per carton were dropped overboard and the carton was made so as to disintegrate in sea water. Unlike the first drop these specially made bottles had the outline of the North American continent on them. The bottles were sealed with a lead capping to protect the small number of documents they contained, the most interesting of these being a colourful certificate from ‘the Office of King Neptune’. In addition, there was a little booklet recounting the story of Guinness and a special gold-coloured GUINNESS® label attached to some instructions on how to turn the bottle into a table-lamp. 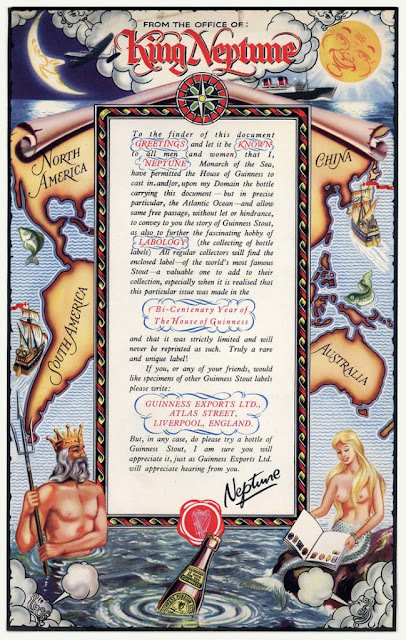 Sometimes the bottles contained other items such as an advertisement for Ovaltine (who helped sponsor the bottle drop) or a notice about the ship concerned.